The early hours of this morning (21st January 2019) was the chosen date for the launch of Anti Imperialist Action Ireland ‘This is our Mandate – This is our Republic’ campaign in Scotland. 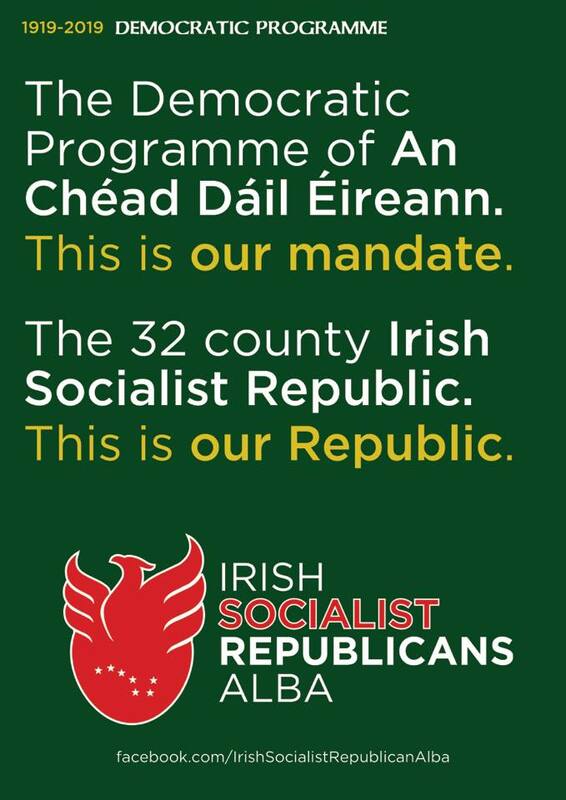 The campaign aims to defend and rebuild the Irish Socialist Republic. As part of series of campaign initiatives planned in the coming weeks and months, a group of activists from Irish Socialist Republicans-Alba hung the pictured banner across the M8 motorway in Glasgow City Centre. 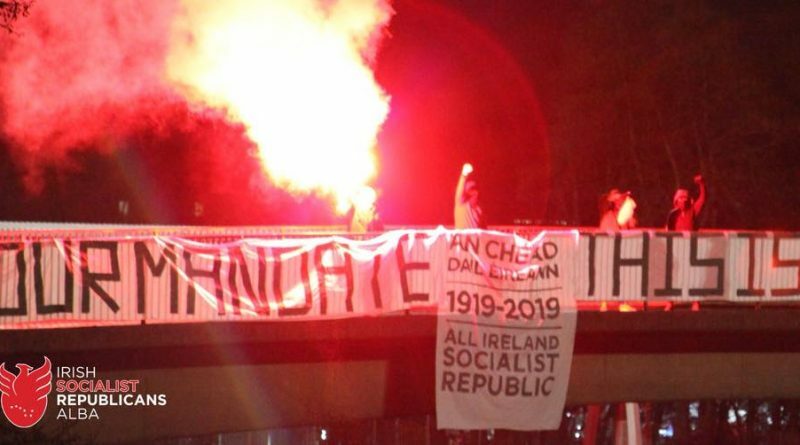 The banner; ‘This is Our Mandate- An Chead Dail Eireann, 1919-2019, All Ireland Socialist Republic- This Is Our Republic’ remained on the motorway for several hours for hundreds of passing cars to read. This action was also to commemorate the 100th Anniversary of the establishment of the Irish Socialist Republic with the formation An Chead Dáil on January 21 1919. Building on the 1916 Rising, at that first meeting of the Revolutionary Dáil Éireann the democratically elected representatives of the people of Ireland declared our Independence and released three documents to confirm the establishment of the Irish Socialist Republic. These documents were the Declaration of Irish Independence, A Message to the Free Nations of the World and the Democratic Programme. Of these documents the Democratic Programme is the most important. With the 1916 Proclamation, the Democratic Programme outlines the Revolutionary Socialist nature of the Irish People’s Republic and sets out the type of society that would be established in the People’s Republic. Irish Socialist Republicans view the 1919 Democratic Programme as a seminal document of modern Irish History. It is a living document as relevant today as it was a 100 years ago, when we analyse the nature of Irish society today across two failed capitalist statelets, we can see the relevance. In attempting to make this a reality, Irish Socialist Republican activists in Scotland have begun to distribute hundreds of the pictured full colour poster-size copies of the Democratic Programme to Irish Republican activists, supporters and the wider Irish community across Scotland on a not for profit basis. Anyone interested in helping with the campaign, receiving a Democratic Programme or becoming involved in Socialist Republican activism please don’t hesitate to PM our page.